Cut this tasty pizza into small squares and serve as an appetizer alongside chilled white wine. For Caramelized Shallots, heat butter in large saucepan and cook shallots until caramelized. Stir in molasses and vinegar; season to taste with salt and pepper. Continue to cook and stir until all liquid has been absorbed. Set aside to cool. For Pizza, pre-heat pizza stone or heavy baking pan in 500°F oven for 30 minutes or more. 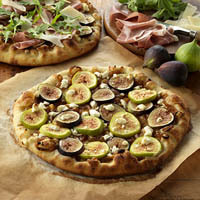 Meanwhile, spread figs on sheet pan or tray; drizzle with olive oil and honey, then season with salt and black pepper. Set aside. Then, on 12x12-inch piece of parchment paper with lightly floured rolling pin, roll pizza dough to about 1/4 inch thick. Brush generously with olive oil and spread Caramelized Shallots all over. Arrange sliced figs about 1/2 inch apart on top of shallots and season lightly with salt and black pepper. Sprinkle goat cheese evenly over all. Transfer pizza to pre-heated stone and bake, 10 to 15 minutes at 500°F or until cheese and edge of crust are lightly browned. Remove from oven and transfer to cutting board; let stand and cool slightly. Then, cut into wedges, and garnish with sliced prosciutto, Parmesan, and arugula.